The Yumthang Valley is a grazing pasture surrounded by the Himalayan mountains in the North Sikkim district of Sikkim, India. It is at an elevation of 3,564m It is popularly known as 'Valley of Flowers' and is home to the Shingba Rhododendron Sanctuary, which has over twenty-four species of the rhododendron, the state flower. A tributary of the river Teesta flows past the valley and the town of Lachung, the nearest inhabited centre. Yumthang is closed between December and March due to heavy snowfall. Timber Trail, counted among the famous tourist attractions of Parwanoo, offers a cable-way ride of the Shivalik Hills. The trail is spread over two hills of the Shivalik Range and is connected by a cable car. Having a loading capacity of 10 to 12 people, this cable car offers beautiful views of the Kaushalya Valley. The aerial cable-way is constructed at a height of 5,000 ft above sea level. The ride lasting for few minutes covers a stretch of nearly 1.8 km. The place is not far from Parwanoo and is managed by a private resort. Kanchenjunga range is not the highest mountain range in India but also a sacred entity among the people of Darjeeling. To get the best view of Kanchenjunga, you cannot think of a better place than Darjeeling. The five peaks symbolize the five important treasures of life namely Gold, Silver, Gems, food grains and religious texts. Darjeeling offers a breathtaking close view of the Kanchenjunga mountain ranges. There are many hotels in Darjeeling with the view of Kanchenjunga from the rooftop lounge, balcony and provide a quality accommodation to the tourists. Tourists even prefer to climb the mountain to reach the summit of Kanchenjunga. The climbing routes to Kanchenjunga is on the North eastern side of Sikkim. The Darjeeling War Memorial is amongst the most visited places from which Kanchenjunga can be clearly observed. Built by the colonial British in 1896 to accomodate Indian prisoners, the Cellular Jail stands as a dark reminder of the British rule in India. Escape from this facility was impossible, due to its seperation from mainland and strict vigilance of British soldiers. Today, the Cellular Jail serves as a museum and depicts the Indian Freedom Struggle in all of its brutality. The jail had seven large wings in the original construction blueprint, with an alarm bell in the central to raise alert. But two wings were demolished after India achieved Independence. Today it is considered as a National Memorial with tourists coming in from all over the world to visit this gargantuan jail. The jail houses numerous galleries with pictures of famous figures of the Indian Freedom struggle. Several life size models of jailers torturing the inmates represent the hardships of an inmate's life. The entry fee is Rs.30 per head with extra charges for camera. The Light and Sound show, which is regularly hosted at evenings, is well known. The Living Root Bridges of Meghalaya, are nothing short of a beautiful fusion of man-made and natural pinnacle of construction. Originally created by the Khasi tribe, the roots or the "bridges" grow from the ancient rubber trees, which are found only in the North-East India. According to locals, some of these bridges are made from roots, which are well over 500 years old. 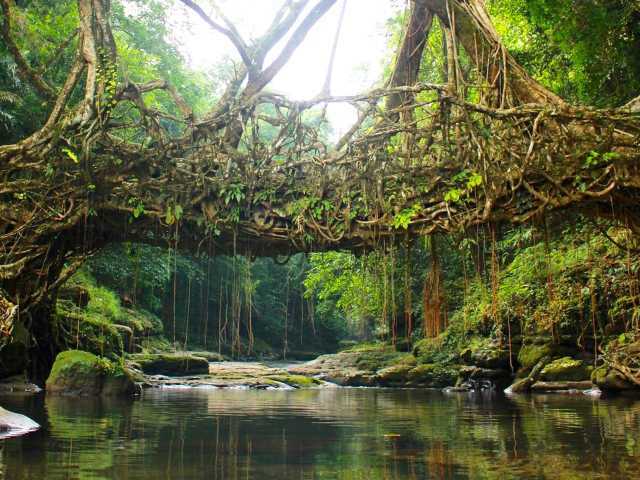 The major tourist attraction among these bridges is the Double Decker Living Root Bridges of Cherrapunji. The path to reach this particular Living Root Bridge consists of nearly 3000 stair-steps. And since the Bridges are not built, but grown naturally, the beauty of the Bridge is astounding. These indigenous architectural marvels provide a practically free alternative to wooden bridges, which get spoiled in an area receiving as much rain as Cherrapunji. This is the highest point in Kasauli, Manki (Monkey) Point is 4 km from the bus stop and has a temple dedicated to Lord Hanuman. There is a 3 km walk from bus stand to Indian Air Force station from there you have to climb up a steep staircase of around 1 km. The hike up to the temple can be a bit difficult for those who are not used to climbing, but it is worth the effort. A tough climb to the top will reward you with beautiful valley views. You can watch the brilliant sparkle of the Sutlej river as it makes its way through the plains and the pure beauty of the snow-capped peaks of the Dhauladhar Range. The signing of the route starts from the Church. There are some restrictions such as one is not allowed to carry bags or cameras inside the Air Force Station. Zero point is the highest vantage point located in the premises of Binsar sanctuary. To reach there one has to walk through a 2 km narrow jungle road as it is accessible only by foot. 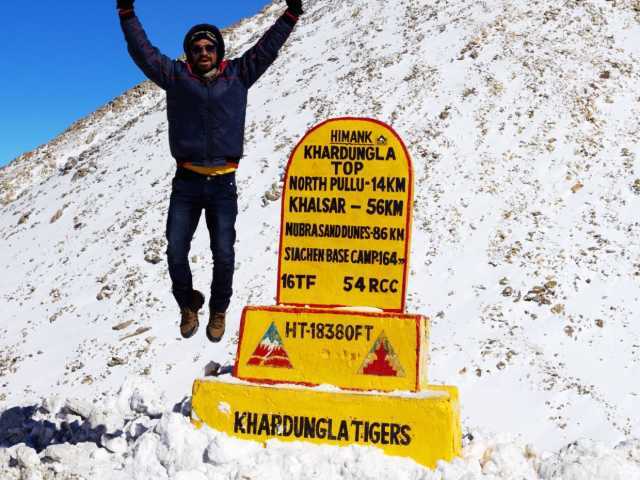 As the name describes, Zero point is the end of the road that offers a 360-degree panoramic view of mighty ranges of Himalaya that includes Nanda Devi and Kedarnath Mountain. As you walk through the woods, you may find the jungle studded with trees like Oak and Buransh (Rhododendron). You may even spot some wildlife creatures and beautiful birds on the way so keep your binoculars and camera handy. The view from Zero point which is located at a height of 2400 meters is fantastic. The sight of snow gently places on the top of mountains and the cool breeze caressing your face is enough to Detox the chaos that you have held within and lose yourself in the serenity of nature. Zero point is a part of Binsar wildlife sanctuary, but there is less wildlife present here now. Take a guided trek inside this wildlife sanctuary to explore the nature around this prestine jungle. You can get to view trees of Oak, Buransh(Rhododendron). The Tungabhadra is one the major rivers in South India. For the majority of its route, it flows through Karnataka, before joining the Krishna river at the border of Andhra Pradesh and Telengana, and ultimately draining into the Arabian Sea. The Tungabhadra is formed by the confluence of two rivers, namely Tunga and Bhadra at Koodli. This river has a major historical importance in South India. Many ancient temples and palaces were constructed overlooking its banks. The famous city of Hampi is situated beside the river. The Vijayanagara empire was prosperous due to its close proximity to Tungabhadra, which was exploited to its full measure. Today, the Tungabhadra Dam has been built across the river. It is the primary source of water to the surrounding settlements. The dam has become a retreat spot for tourists and locals. If you are lucky enough, you can see the might of Tungabhadra, when the dam gates are opened. Explore Halong Bay with popular cruise ride through rock islands, natural grottoes, floating villages, caves and spectacular beaches. Generally a cruise trip takes 2 to 3 days. Cruise trip is the best way to explore Halong Bay with leisure. Do try Vietnamese cuisine served on the cruise. Howrah Bridge is the iconic symbol of Kolkata city and West Bengal. The world famous Howrah Bridge renamed as Rabindra Setu is built over the Hooghly River and connects the cities of Kolkata and Howrah. The Howrah Bridge facts state that a daily traffic of around 100,000 vehicles and 150,000 pedestrians travels through the bridge making it the world's busiest cantilever bridge. The Howrah Bridge of Kolkata is the world's sixth longest cantilever bridge. The bridge is a complete riveted structure with no nuts and bolts. One of the most celebrated landmarks of Kolkata, the Howrah bridge is also a great tourist attraction of Kolkata and the state. Tourists generally start their Kolkata tourism from the Howrah bridge only. Clicking pictures on this bridge from different angles is something that every tourist wants. You can also enjoy some shopping on the various street shops near the bridge. A number of movies have been filmed on the Howrah bridge. The Howrah Bridge movies connect contains a long list of great Bollywood movies. The sunrise in Khajjiar is one of the most magical moments that one can experience. Witnessing the first orange hued rays of the sun fills the body and the soul with energy and hope. Bit by bit it covers the pearly morning haze with pure white light. The sunrise point in Khajjiar is one of those places to witness this magical event in person. You will have to wake up early in the morning but it would be worth the effort. It is situated atop a hill. When the first rays of the morning hit the mountains the whole area bathes in a holy glow. The sunrise from here is as mystical as it can get and a must do for when you visit here. Zojila pass in the western section of the Himalayan mountain ranges is located on the Indian National Highway one between Srinagar and Leh. Zoji pass is termed as the gateway to the majestic Ladakh. The pass is 9 kms from Sonamarg and is an important link between Ladakh and Kashmir around 3528m that is 11, 649 ft. above the sea level. This pass is considered to be the second highest pass after Fotu La on the Srinagar-Leh National Highway. You are going to have an amazing view of the mighty Himalayan Mountains, once you reach the pass, which makes the ride worth. This pass witnesses the heaviest snowfall during the winters and thus, remains closed to traffic for around six months in a year. Zojila also overlooks snowcapped summits and dense jungles, besides the lush green Dras valley. While driving towards Zojila, travelers are expected to be centered between Kashmir basin on one side and Dras on the other. The lifeline of Ladakh is the 434 kms long highway stretch. You haven’t seen Singapore until you’ve seen it from the Sands SkyPark Observation Deck, soaring 57 levels above the heart of the city. Drink in the panoramic vistas of stunning Marina Bay, the world-class cityscape, the architectural wonders of Supertree Grove, and the vibrant colours of Gardens by the Bay. From Marina South Pier all the way out to the Singapore Strait, observe the bustling shipping lanes that have built Singapore’s rich multicultural history. Hone your photography skills from the best vantage point in the city. Whether blue waters glittering under a clear bright sun, or the spectacular laser light show Wonder Full after night falls, the Observation Deck is the place to be for capturing the picture of a lifetime. The Sunset point offers a magnificent view of the nearby hill regions, and of plains Chandigarh, Panchkula, Mohali, Kalka, Pinjore, Parwanoo, Baddi and Nalagarh all are visible as an eagle eye view from this 270-degree viewpoint. This point is popular yet a very quiet spot to enjoy the sunset, pine-laid landscapes, valleys, and sceneries. Nearby to the Sunset point is a trail or a path known as the Lover's Lane which is an only more quiet walk through the valleys and some of Kasauli's most calm and breath-taking sceneries.